The Principle of the Hedgehogs is a way to introduce to the group to the balance between being reserved and opening up. Hedgehogs must find the right distance from each other to both enjoy warmth and not get pricked by spines. Likewise, participants must find the right distance between guardedness and collegiality. Ask the group: we all have our professional selves and our most authentic, “shoes of” selves. To be successful in what we want to achieve, where is the right balance for this group? The Principle of the Hedgehogs comes from Arthur Schopenhauer. Want to share this as a handout with participants? Click here! 3. Welcome wild ideas. Wild ideas spark creativity. If an idea sounds ridiculous, challenge yourself to remain open and curious. Ask yourself questions like, “How might I adapt what I’m hearing? What ideas does this generate for me?” Think divergently. For now, abandon the typical constraints. 4. Build on the ideas of others. Use joining language: say “and” instead of “but.” Do not only share new ideas. Use the idea that came before to conceive a new idea. Stay focused. Divergent thinking is fun, but try to stay focused on the topic, otherwise conversations can drift outside of scope. One conversation at a time. Wait a beat before sharing the next idea. Encourage active listening. Make space for more quiet team members. Be visual. 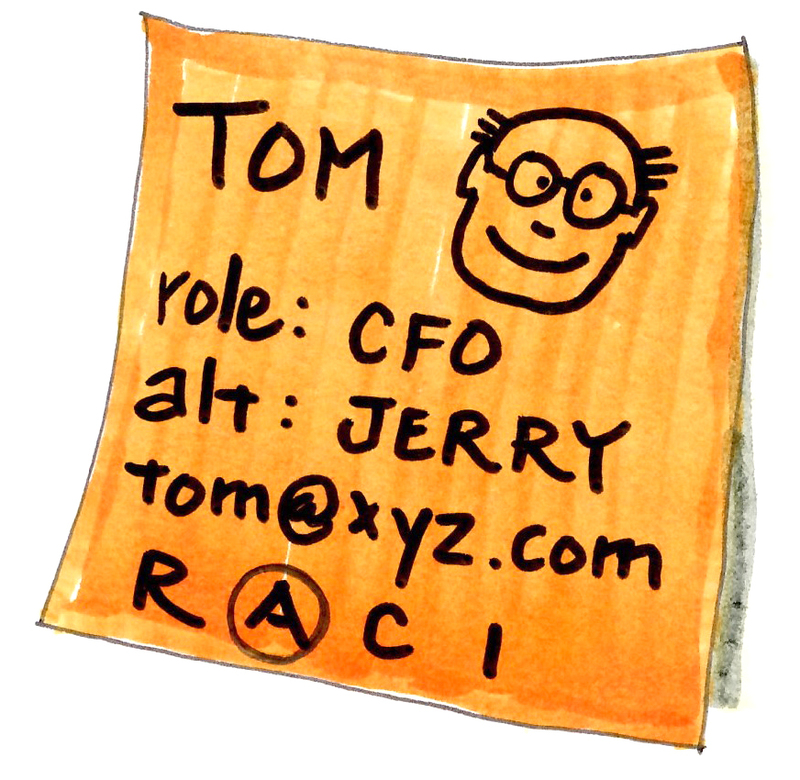 Draw a quick icon on a sticky note to create a stronger mental model of your idea. Drawings convey ideas faster and more concretely than words. It doesn’t have to be pretty! Use a visual vocabulary as a reference. Fallacy: Social loafing. In a group, some individuals tend to sit back and let others do the work. Solution: Use a round robin, serial share, or brainwriting, where participants share ideas in sequence. Fallacy: Production blocking. Only one person can talk or produce an idea at once, while the other group members are forced to sit passively. Solution: Break the large group into smaller groups, pairs, or individuals. Task participants to generate ideas in their breakouts, then bring those ideas back to the large group. Harvest written sticky notes to encourage brevity. Fallacy: Evaluation apprehension. The fear of looking stupid in front of one's peers. Solution: Use ground rules and principles to set up a place of safety and respect. Harvest written sticky notes anonymously. Maybe you've seen the 9-dot/4-line version of this puzzle, but have you seen the 16-dot/6-line version? From Francis D.K. Ching's "Drawing: A Creative Process"
This visual energizer highights heuristics: the different approaches different people take to problem solving. Share this challenge with a group and turn them loose to solve it. Ask them to call out "Done!" once it's solved. Give no other instructions than to solve the challenge. Then watch what happens. Some individuals will go head down and try to solve it on their own. Some will try to work with others. Some will solve it quickly. After 10-20% of the participants have solved it, stop the exercise and ask a few people to share their solutions with the group. Compare results. Are they the same or different? Then ask participants to share their approaches to solving the problem. HOW did they go about finding the solution? Did they try it on their own, or collaborate with others? Did they first think about in their heads, or immediately put pen to paper? Had they seen the 9-dot/4-line version somewhere and try to apply that solution? Did they wait until someone else figured it out, then copied? Did they get frustrated and give up? Did they Google it? What matters here is not the solution so much as the different approaches that participants took to solving the problem. Heuristics are the unique approaches individuals take to problem solving. APPLYING those heuristics will produce solutions that are more accurate, creative, and widely accepted. This touches directly on the value of diverse and inclusive teams. I first saw Joe Gerstandt use the 9-dot/4-line version of this puzzle applied to heuristics. What I like about this 16-dot/6-line version is that fewer people have seen it before, so they really have to work to solve it. Also, THIS version has several solutions, whereas the 9-dot/4-line version only has one. There's also a lesson to be drawn from gathering MANY solutions rather than stopping with the first "RIGHT" solution. PS: Here's two solutions. There are several. It took several sticky notes to get to this point. Clustering and categorizing ideas occurs in nearly every facilitation. Sometimes, participants will argue about what the categories should be. Too much argument over categories is like spending time figuring out ways to slice a pie rather than actually eating it. "If all I told you was, 'Meet me in Paris,' where would you go?" "Charles de Gaulle airport, because it's easiest to get to." "The Louvre. Going to the Louvre is on my bucket list." "There is this one café I always go to when I'm in Paris. If we're friends and you know me, then you'd know to meet me there." "Paris, Texas. Bet that's not the answer you were expecting, huh?" "I wouldn't go. Not enough information to justify the plane ticket." "When you're choosing categories for these ideas, what matters is that they're easily, quickly understood by everyone. You could argue about why Charles de Gaulle airport or any of the other options is the 'best' answer for one reason or another, but what most people will choose is the Eiffel Tower. Choosing a clear organizing structure is especially important if we're going to have to share our work with people who aren't in the room. So, as you think about how to organize these ideas, choose categories that are the most obvious. 'Obvious' is just another way to say 'easily understood.'" 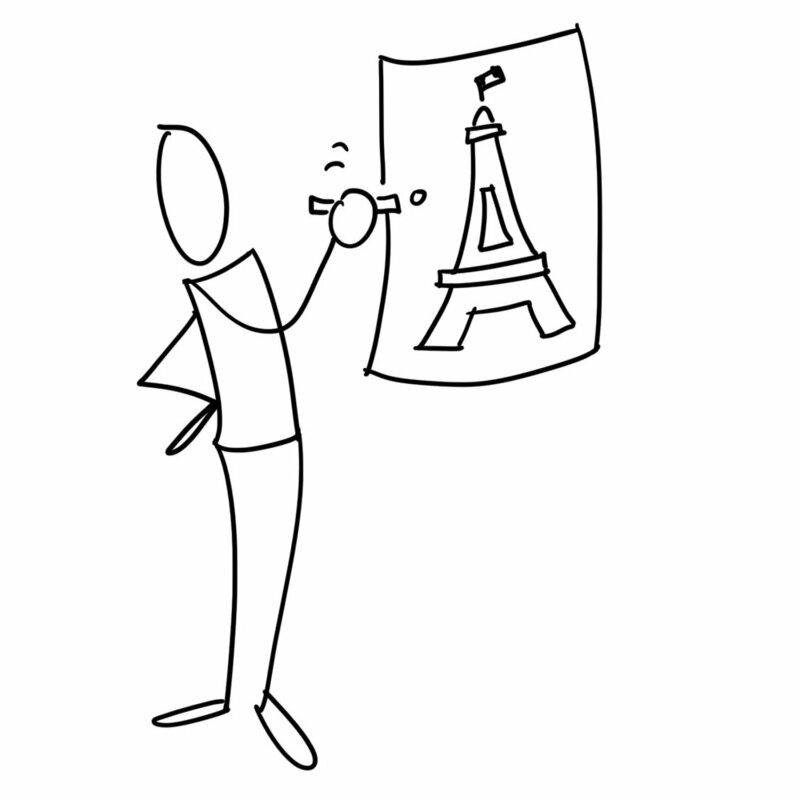 After you've introduced the Paris Principle, draw a poster of the Eiffel Tower as a reminder to point back to. PS: If you're facilitating the group through self-work, there will be plenty of feedback opportunities that arise from their answers to the "where would you go" question. Ask the group to connect specific answers back to behavioral models such as the Keirsey Temperments, Myers-Briggs, DiSC, or FIRO-B. It's my hope that visual practitioners not only provide their skills, but also teach their skills to others. Please feel free to use, modify, and distribute any of this content! Thanks to Heather Lynn Osborn-Herbert, Lisa Nelson, Erin Gordon, and Caryn Ginsberg for volunteering their time to help graphic record the session. Thanks to Mark Tarallo and the Nysmith School for video recording. Special thanks to Heather Lynn Osborn-Herbert for her video editing! While on an extended project, I got to my desk one morning to find a sticky note saying, "Brian: be at the large conference room at 8AM." That was it, no other explanation or instruction. It was ten minutes until eight. Work there usually started at around 8:30, so I felt lucky that I happened to arrive early that day. My gut told me I might want to bring a roll of paper and some markers, just in case. At that time, I wasn't a full-time facilitator. I got to the conference room a few minutes later and sat down at a huge table along with about thirty other people. At 8AM, my client (the only person I recognized) stood up, said, "Thank you all very much for coming on short notice." Then he looked at me and said, "Brian, over to you." Then he sat down. Dynamic facilitation is designing an approach in the moment to meet participants' needs. Why would you do dynamic facilitation? You might need to pivot an approach. Despite all the best preparation, there are moments when you realize that the approach you designed isn't going to get participants where they want to be. This is different from when participants naturally resist the process. This is when you recognize that the logical flow of activities won't result in the outcomes the participants want. You might intentionally leave space in the agenda to dynamically facilitate. For example, in facilitating an Open Space session or Salon session, you might choose to wait until a conversation is happening before offering a method or activity to help facilitate it. Or, you may find yourself in front of an ad hoc meeting with zero time to prepare. Like what happened to me. Whatever drives it, there are five essentials to successfully facilitate dynamically. 1. Presence. First, get yourself together. This may sound like your worst nightmare, like showing up for a test you haven't studied for. Regardless, it's your job to stay calm, cool, and collected. Participants take their mood cues off you. Keep your facial muscles relaxed (no wide eyes or gaping jaws), keep a calm and even tone of voice, maintain open body language, and breathe slowly and deeply. 2. Authenticity. Second, don't be disingenuous or falsely confident about what's happening. The agenda is not a precious thing to protect. Let go of any illusion of control, or any ego. Call a balcony moment and do a process check with the group: "I'm sensing that this may not be getting us to where we want to be. To what extent do you feel like we need to switch tactics and try something else?" The first four parts of the Drexler-Sibbet Team Performance Model can perform double-duty as a facilitation model: Orientation-Trust Building-Goal Clarification-Commitment. Whichever you choose, having an overarching approach in the back of your head as you select methods will help participants bring in new ideas, assess them, and decide a way forward. 4. Methods. This is where you really have to know your stuff as a facilitator. These are the tools in your toolbox, the cards in your deck, the activities and group processes to help the group achieve its outcomes. The IAF Methods Database recently got a face-lift from a partnership with SessionLab, and it's a fantastic resource for facilitation methods. Additionally, check out The Facilitator's Guide to Participatory Decision Making, Gamestorming, Best Practices for Facilitation, Visual Meetings, Design a Better Business, and Innovating for People as a start to building your own personal methods library. 5. Flow. Mihaly Csikszentmihalyi defines flow as "a state of concentration or complete absorption with the activity at hand and the situation. [You] are so involved in an activity that nothing else seems to matter. The idea of flow is identical to the feeling of being in the zone or in the groove." Nancy Reuscher calls it "being a styrofoam cup on the sea of change." David Sibbet simply says, "It's like jazz." How ever you define it, be in flow. If you know you're a strong J on the Myers-Briggs, be ready to flex your P. Be mindful, present, aware, relaxed, and roll with whatever happens in the room. Dynamic facilitation can at once give you both the scariest and most rewarding moments of your career. Epilogue: By request, here's the rest of the story. First, I focused on my presence. I got my head straight and reminded myself the rule of group dynamics: chances were, I wasn't the only one feeling lost and confused. Second, I was authentic about what I was feeling. I stood up, started hanging a blank chart, and said, "Thank you, sir. And thank you all for coming on short notice. Now, I'm sure many of you are a little unsure about why we're here. I am too." Third, I decided on Kaner's divergence-groan zone-convergence as a model for the meeting, for no other reason than that it can be applied to just about any outcome-driven meeting. Fourth, I chose a divergence method to bring in different ideas. I said, "Let's take a minute and get on the same page. I'd like to go around the room and do introductions. Please say your name, your role, what you'd like to get out of the meeting, and one interesting thing about yourself that no one in the room already knows." And I drew a Team Portrait. By the time we had gone around the room, the tension had been broken, and I had everyone's name and expected outcome for the day. About half of the participants had clear expectations, the other half had no idea why they were there. We clustered all the outcomes into five or six overarching themes, then prioritized them using straw polls. Once we had the outcomes, I invited participants to each share what they might offer to help achieve those outcomes. That engaged the participants who hadn't known why they were there. Fifth, to the best of my ability, I tried to flow. For each subject, I offered suggestions for information sharing and decision making methods, but I put the ultimate decision of which approach to use back on the group. I watched the body language of individuals to know when to suggest breaks or different work mixes. And I regularly checked the process: "How is this working? Do we need to pivot and try something else? Where do we go from here?" The meeting turned into a working session and went until the end of the day. Halfway through, I had to run and get another roll of paper from my desk. When we finally closed, several participants said, "This is the best meeting I've ever been to." I took the next day off. As a facilitator, VOICE is a big part of how you show up and present yourself in front of others. UCLA studies showed that people pay FOUR TIMES the attention to tone of voice over the words themselves. Here are some great exercises to project your voice and be heard. We ask participants to talk about abstract things. "What does your future look like?" "What is your leadership style?" "What's happening in your industry?" Giving participants a concrete anchor, however nonsensical, is a great way to access abstract concepts and start people talking. In his body of knowledge around kinesthetic modeling, John Ward calls this "useless sense-making." My favorite method for providing concrete anchors to abstract concepts is the Center for Creative Leadership's Visual Explorer which I've written about before. Unfortunately, the full size version is as big and heavy as a phone book, so using it has to be planned ahead of time. Plus, at $380, it ain't cheap. As a light, packable, impromptu alternative to Visual Explorer, I always carry a set of Rory's Story Cubes. ...what you'd like to get out of our time together?" ...what's happening in your organization?" ...the opportunities you or your organization is facing?" ...the challenges you or your organization is facing?" ...the culture of your organization?" ...what an ideal organization looks like?" ...where we are as a team?" ...how we want to be perceived?" ...the vision of your organization?" Depending on the size of the group, individuals can report out to the whole group or just to the people sitting around them. If there aren't enough cubes to go around, form small groups to share a cube and report outs. Even if not everyone reports out, you'll definitely want to ask for volunteers to share highlights out to the whole group to get a sample of answers to the question. I have the Original and Voyages Story Cubes sets. Trent Wakenight, Lauren Green, and Ben Tinker recently augmented my set with Space Travel Dice by Laurence King. I was right in the middle of a facilitation, with thirty people around me busily filling out graphic templates, when the door flew open, someone I'd never met before stormed in, stuck his finger in my chest, yelled, "I don't know who you think you are, but I'll see to it you never work in this building again!" and stomped out. No fair reading on if you don't have an answer in your head. In that moment, the lizard brain triggers. Fight or flight. Most have the presence of mind not to fight. We don't yell back. We don't throw insults. But it's soooo easy to default to flight. Flight isn't just running away. It's ignoring what happened. Or laughing it off. Or saying, "Alright, alright, let's get back to the agenda." But that ignores the Rule of Group Dynamics: if you're feeling something, chances are someone else is feeling it too. Here's what I did. I'm not saying it's the best thing to do, or even the right thing to do, but I'm glad I handled it the way I did. I pulled the participants up to the balcony. I said, "Okay, so that just happened. We're going to stop right here for just a moment. I want everyone to tell me what's going on for them right now. In one word, what are you feeling?" Angry. Sad. Irritated. Upset. Mad. Frustrated. Disappointed. Ashamed. Humiliated. "Okay. Now that you've put a label on what you're feeling, who can briefly tell me what they believe just happened?" The first few comments were judgmental and derisive, but soon, participants starting exploring why that person might have behaved the way he did. I asked, "Can someone tell me how what we're doing might have looked from his perspective?" They shared some ideas, and as they did, the tone quieted, the room calmed, and someone said, "I think we can get back to work." Pausing the facilitation allowed participants to empty their emotional backpacks of what had just happened. Had they not done so, they would have been at best distracted and at worst, destructive. Asking participants to name the emotion they were feeling was actually a first step toward moving past it. In his book The Misleading Mind, Karuna Cayton says, "Thoughts, emotions, and all mental experience are quite slippery. When you try to grasp and hold on to the inner experience, it slips away, like trying to grab a fish with one hand." Naming an emotion is a gateway to dealing with it objectivity. Asking participants to share what they believed happened was a "Vesuvius:" a time-boxed, tightly-controlled chance for participants to get anger off their chest and blow off remaining steam. Finally, asking participants to adopt the perspective of the intruder had one intent: to build empathy for the intruder. It's hard to stay upset with someone you understand. At this point, the lizard brain is back in its cave. That moment was my biggest facilitation nightmare, by far. But because it was such a nightmare, it was also one of my proudest moments. If you have the right tools and the right mindset, you'll know what to do when stuff blows up. Epilogue: The intruder had been given some bad information about what we were doing and felt personally threatened by it. He apologized to me, and ended up becoming one of my strongest advocates and best clients. We're not always our best selves. By request, here's the gear I carry. I love finding new tools for graphic facilitation and graphic recording. I use small, fabric Ikea cubes and zippered pouches as kits to swap out the stuff I need depending on what I'm doing. My standard gear bag is a nylon Field & Stream fishing bag with a shoulder strap. It has tons of compartments and can hold three or four of the kits detailed below. It's good to carry enough materials for one-to-three days of work. I also have a smaller repurposed camera bag that can hold one or two kits that's good for a couple of hours of work. For jobs that go longer than three days and require a lot of materials, I have a rolling Stanley FatMax Mobile Work Station with drawers, trays, and bins. I also have a small tool hip pouch for easy access to markers while I'm working. Black (Neuland 010 and 100), red (200) , and gray (101) is a simple, fast palette for graphic facilitation. Black for text, red for emphasis and connection, and gray for containers and clusters. Extended color palette for graphic recording with Neuland Art Markers, No. Ones, Big Ones, and Montana markers. To keep from having to carry a lot of Big Ones or Montana markers, I carry one empty marker and a plastic case full of inked nibs. Bottles of ink, new nibs, small pliers to pull out nibs, a folding cardboard ink refill station, one or two ink spare bottle bulbs in case a needle breaks, and a rag for wipes and spills. Razor to cut paper, scissors, white artists tape to hang paper, blue non-photographic pencil, carpenter's pencil (it's easy to sharpen with a razor), Kum pencil sharpener, kneaded eraser, rubber bands to hold rolled finished charts, t-pins to hang charts on fabric walls, white out and labels for cover ups, double-sided tape to hold down sticky notes. Sketchnoting supplies: Sharpie pens, fine one Neuland markers, Tombow markers, Zig markers. Two tools you don't often see for drawing perfect circles: an arc compass (also called a beam compass or trammel, available at hardware stores), and Heather Martinez's custom plexiglass templates for drawing circles. Stickies and sharpies for participants, a small inflatable beachball, Angel cards, Story cubes, a couple of whiteboard markers, kinetic toys, Tibetan tingsha chimes. Business cards, Lizard Brain stickers, postcards, thank you notes. Giveaways and guides to give away to people who show interest, Mike Rohde's Sketchnote Kickstarter, Mindmapping Basics, Sketchnote Basics, Flipchart Fundamentals, Visual Vocabulary, Q-FORCE framework. 4-panel Neuland LX-W. and/or an original Neuland wall. The original wall sets up a lot quicker, but the LX-W can angle back, adjustable height, and packs tighter. On the LX-W, I like to put the marker trays on AFTER setting up the panels on the cleats to help secure the panels to the easels. I also use big spring clamps to hold paper to the wall it's faster and cheaper than tape. Yes, there's a lot of other, less expensive paper out there, but I still like the Grove's 25-yard rolls. It's super smooth and doesn't bleed (unless your markers are super-juicy or you're using Sharpies.) I usually average one roll per whole day of work. I use a ski tube to carry new rolls and finished charts. Small portfolio of examples of work I like (thanks Trent! ), sketchbook, and Heather Martinez's lettering guides. Job file: contract, client-specific stickers, facilitation guide, image library, logistics/travel information, printed correspondence. The Grove Consultants' Team Portrait is, I think, the best Starter for a facilitation. (You can read about the Team Portrait method in The Grove's Strategic Visioning cards, on page 127 of Visual Meetings, and on page 103 of Graphic Facilitation.) Simply, it tells you who's in the room. But what about recurring events that spread out across several days? Increasingly, organizations are forming cross-functional working groups, which may meet periodically. There may be alternates, absentees, and new attendees. New or missing faces either have difficulty contributing or can pull a group back to the beginning of the learning curve. One way around this is a variation on the Team Portrait called Here and Gone. In addition to the seating chart that tells you who's "Here," have a flipchart handy as a holding area for those who are "Gone." When first introducing Here and Gone, have participants fill out stickies with their name, their role as it relates to the project, an alternate who will step in for them if they need to be elsewhere, and basic contact information. You might have participants identify whether they are Responsible, Accountable, Consulted, or Informed relative to the project, following PMI's RACI approach to assessing stakeholders. You can also have participants draw a self-portrait on the sticky as a light Energizer and fun icebreaker. Invite each participant to share their sticky with the large group. Draw a "Here" chart, which is a simple drawing of the room's seating layout, and place the stickies relative to where participants are seated. At the end of the facilitation, move all the stickies to the "Gone" chart. 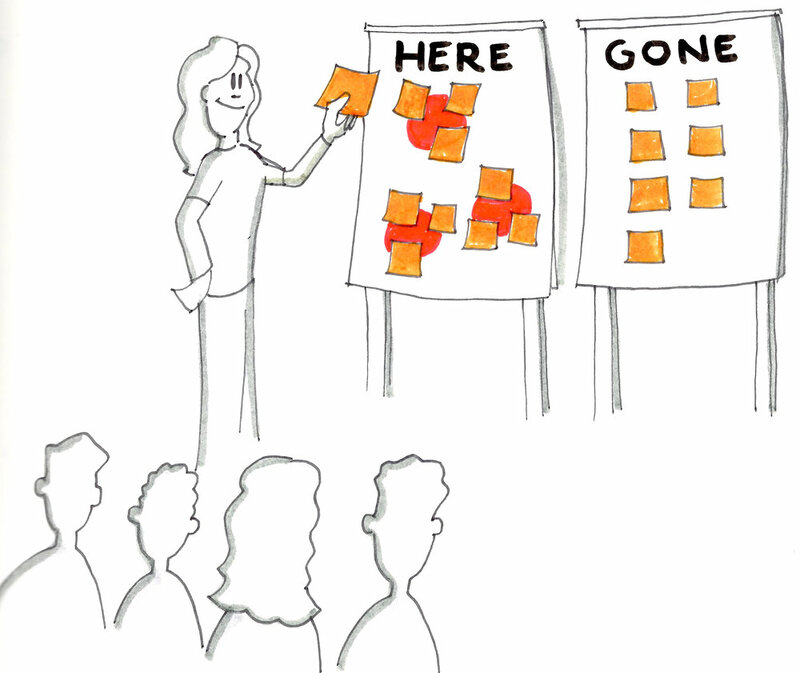 At the next meeting, move the stickies from the "Gone" chart to the "Here" chart as participants take their seats. If anyone is absent and left in the "Gone" chart, remind the alternate that they have responsibility to bring the absentee up to speed at a later time. If both participant and alternate are absent, ask for a volunteers to update the absentees. If a new participant shows up, pause the meeting, welcome them into the group, ask them to fill out a sticky note for the "Here" chart, and ask for a volunteer to quietly bring them up to speed on the group's progress thus far so the rest of the participants can carry on. If you've been capturing progress on graphic charts and they're posted around the room, a gallery walk is the best way to bring in new participants. PS: When I do a Team Portrait, I like to ask participants to share four things: their name, their role, their expected outcome for the facilitation, and one interesting thing about themselves that no one in the room already knows. In my role as a facilitator, all I really care about is name and outcome, and that's typically all I capture on the Team Portrait. Knowing expected outcomes allows me to pivot the approach to the facilitation if necessary. Knowing role allows other participants to orient to that person. The one interesting thing isn't just a quick Energizer; it also buys me a little time to catch up on writing what the person just said. Mindmapping is a foundational skill to graphic facilitation. Once you start mindmapping, it's easy to get hooked, and even easier to transition into using more sophisticated visual methods. Be at the Right Altitude is a Principle that sets up conversations to be at the right right level of detail. At the top of a flipchart, draw objects you'd find in the sky, like a plane, clouds, and a hot air balloon. In the middle of the flipchart, draw mountains and hills. At the bottom, draw grass and weeds. Draw a vertical double-headed arrow to represent the concept of altitude. Ask participants, "What would be some examples of topics that are at too high a level for the conversation we're about to have?" Record their responses in the sky. Ask, "What are some examples of topics that are too in the weeds?" Record responses in the grass. Ask, "What topics do we need to cover for this to be successful?" Record those in the space remaining in the middle. You might want to circle topics at the right altitude to emphasize that that's where the conversation should be. It's OK to recap the outcomes here. Put all the responsibility for coming up with example topics on the participants. Throughout the facilitation, model and empower participants to ask, "Is the topic at the right altitude" when they sense the conversation is veering too high or too low. Being in the groove with a trusted partner, sharing the load of holding the space for others, is one of the most satisfying moments of the work. My good friend and colleague Nancy Reuscher used to call this "jaeger piloting," referencing the mind meld necessary for two pilots to drive one of the giant robots from the movie Pacific Rim. When you're really in sync, sometimes a glance is enough to pass the baton, shift topics, or even pivot the approach entirely. But sometimes, you need more than a glance to communicate softly and subtly to your partner. WRONG: A big hand gesture, rolling your eyes, looking at one participant in particular, pursing your lips, shaking your head, then going silent while the group continues their conversation. RIGHT: A subtle hand gesture, a nod, followed by, "Why don't we take a 15 minute break?" In other words, it has to be done in openness and with the intent of helping the group process. With that in mind, here's two resources for learning some basic signs that are very helpful in facilitation. The "Signing Savvy" is a searchable website for learning sign that my colleague Rayna Schroeder of Positive Impact Leaders shared with me. 1. In advance, prepare cards with photos of different images. The number of images should be half the number of participants, and there should be 2 cards of each image. For example, if there are 24 participants there should be 12 different images, 2 cards each. Consider images that can be open to broad interpretation, such as landscapes, food, people, animals, and famous paintings. 2. Arrange the chairs in a circle, with a table in the middle of the room. Lay the cards randomly out on the table. You can decorate the table with a tablecloth, to make it look a bit "special." As participants enter the room, ask them to choose one card that they like. 3. After everyone chooses a card, ask them to find the other person who has the same card that they do. Ask them to spend the next 10 minutes talking with that person. The conversation can be about anything, including their work and personal lives. Explain that, after the 10 minutes, they will be asked to write an Appreciation Letter addressed to the other person explaining what they appreciate about him or her. This could be something related to their contribution at work, or personal, like a special quality that they have. They should also know that they will be asked to share this letter with the group. 4. Hand out paper, pens (in different colors), and envelopes. Ask participants to take 10 minutes to write their letters in silence. It is important to enforce this silence. When they are finished, they hold on to the letter and return to their chairs. 5. When everyone has finished, ask for the first pair to volunteer to show the image that they chose in common, and share the letters. The pair stand up and face each other inside the circle. They take turns reading their letter to each other, in front of the group. Sometimes they are shy at first, but usually become more open as the activity progresses. Often, these letters are funny, and some are quite moving. 6. At the end, have a debriefing moment and ask for thoughts about the activity and what they learned from each other. This often leads to a discussion about what they have in common, how the appreciation affected them, etc. Participants are encouraged to put the letters in an envelope and give it to their partner as a gift. Depending on the size of the group, this activity takes 45 min to 1.5 hours. This works well for groups of 6 to 40. After the first day of an offsite, mix it up a little by having this poster waiting at the door for participants to see the next day as they arrive. Finding a new seat forms new relationships as participants sit next to new people. You can also use finding a new seat as a metaphor for appreciating others' perspectives. A variation on this is to also change the room layout. Be sensitive to the amount of materials you're asking participants to move. Gain a New Perspective, Find a New Seat comes from Elise Yanker. I just returned from the annual national conference of the Volunteers of America. The highlight of the event was a workshop delivered by VOA's Robert Gibson, who is leading their innovation efforts at a national level. He introduced design thinking* to conference attendees through a combination of principles and practical activities. Here is one of his principles and two of his activities. The first principle is "Getting Rid of Negativity Bias." This is the tendency to hold back on good ideas, or worse, to shoot down others' ideas with reasons why they won't work before giving them a fighting chance. It's far easier to shoot down someone else's idea with criticism than to put yourself out there with a new idea. This comes from fear of being publicly judged or humiliated (what Susan Cain in her book "Quiet" calls "evaluation apprehension.") Self-censorship is learned early on, and it sticks. As Robert put it, "This is why we start our education with 64 crayons, and we end our education with one blue pen." He went on to say, "If you think your idea is stupid, just think: someone came up with Sharknado. And that's made millions." A way to get rid of negativity bias is to practice the improv technique of saying "Yes, And." And a way to practice "Yes, And" is through the Energizer of the Fake Australian Vacation. Have participants pair off. One begins by saying, "Do you remember when we took a vacation to Australia?" The other responds, "Yes, and we went to the beach?" The other answers, "Yes, and we went surfing?" The other responds, "Yes, and we saw dolphins?" The pair continues the thread, beginning each statement with "yes, and." After about three to five minutes, call time and ask participants to share their stories. Debrief by asking about the mood, the energy, noticing body language and tone of voice, and asking whether it was easy or hard. Tie the Energizer back to the organization by asking about the benefits of using "yes, and" language in the workplace. The second design thinking Energizer Robert introduced was the Parking Lot Circus. Introduce the Energizer by explaining to the participants that they have been asked by their organization to consider holding a circus in the parking lot of their main location. Ask the small groups to first spend three minutes discussing all the "why nots:" all the reasons why having a circus in the parking lot won't work or is a bad idea. Then, after three minutes, they must shift gears and spend five minutes exploring why having a circus in the parking lot is a good idea. Debrief the Energizer by asking participants to share both whys and why nots, what it was like to transition from exploring why nots to whys, and what were some of the innovative ideas that emerged. Ask participants to connect the Energizer back to the workplace: what is the impact of focusing on why nots? What happens when you shift to focusing on whys? *If you haven't yet discovered design thinking, let me just say that the application it has to experiential facilitation is huge. Design thinking is what Tim Brown, president and CEO of IDEO, calls, "a human-centered approach to innovation that draws from the designer's toolkit to integrate the needs of people, the possibilities of technology, and the requirements for business success.” Practically, design thinking provides tools so participants can take their ideas beyond the action list and into prototypes and minimum viable products during the facilitation. 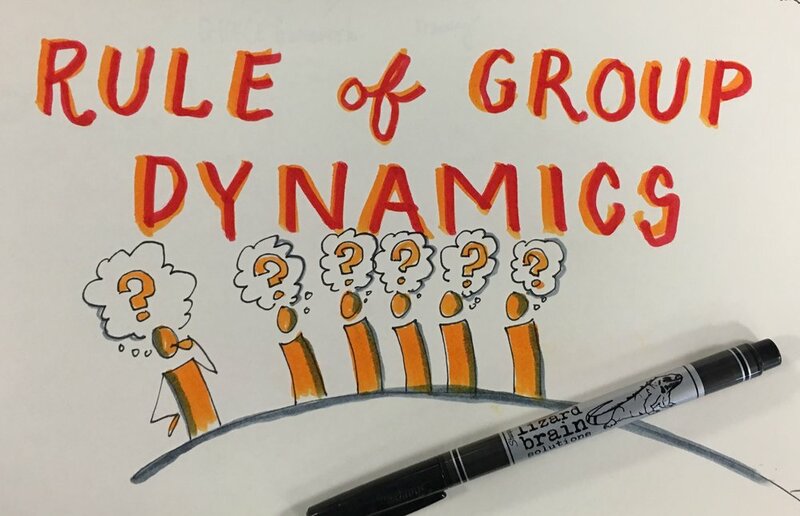 The Rule of Group Dynamics is a great principle to bring into any facilitation to make space for quiet people and give permission to check the process. It states that, if you're thinking something, feeling something, or if you have a concern, chances are at least one other person is thinking the same thing. So, speak up. Say what you're feeling. Ask questions. Make requests. And we'll deal with it openly as a group. I first heard the Rule of Group Dynamics from Elise Yanker. Symbols Of is a quick energizer that frames the day and primes participants for following activities. for Leadership Development: "Draw a symbol that represents a moment when you were at your best as a leader." for Innovation and Creativity: "Draw a symbol that represents a time when you came up with a creative solution to a problem." for Team Development: "Draw a symbol representing a high-performing team you were a part of." for Learning and Instruction: "Draw a symbol that represents a time when you learned an important lesson that you've carried with you." for Strategic Planning: "Draw a symbol that represents an organizational strategy that became real for you." for Success: "Draw a symbol representing a moment of success that you look back on with pride." Encourage participants to favor symbols over literal drawings. Frame your instructions to recall positive experiences. In remembering the positive past experience, participants' mindsets will be better prepared to engage with the facilitation to come. Ask participants to share their symbols, the experience that they represent, and what the experience means to them. Post the symbols together in a place visible for the rest of the facilitation. Symbols Of is an energizer is based on "Learning Symbols" by Dean Meyers. Dean's original concept was expanded to include symbols of any experience by Samantha Oleson. The symbols in the illustration above are the work of the Think With Ink cohort of April 2017. Appreciation Awards are a great way for participants to celebrate and openly recognize each other. Have participants mentally select someone they'd like to call out for a particular act or attribute. Then, they can either make a trophy (by hocking together whatever they can find around the room) or draw up a certificate of appreciation. Facilitate an awards ceremony, where participants say a few words of appreciation then present one another with their trophy or certificate. Have materials for trophies handy and graphic elements for certificates visible. Have a few blank certificates on hand to fill out and present in case anyone gets overlooked. Appreciation Awards are often the highlight of the event. One way to avoid anyone getting overlooked is to prepopulate awards with all the participants’ names and posting them for others to select from.